Brownie ice cream cake with oreo crunchies! To start off, grab a box of brownies. Any box will do. You can also make your own if you’d like. But I was too lazy, so boxed it was. Bake your brownies and once they’re done let them cool down for about a half hour. Bake your brownies in a thick pan. You will need a thick/tall pan because you’ll have other toppings! I wish I would have used and 8×8 pan instead of a 9×13. UPDATE: A reader told me she used an 8×8 and said it was a little too much brownie. So if you love love love (3 times) brownies then use an 8×8 but if you just love (1 time) brownies I’d recommend a 9×13 or 9×11. Once cooled grab frosting. I used chocolate frosting, but you can do whatever you feel. Spread a thin layer on top of the brownies. I did mine REALLY thin. But again, you can do whatever you feel! If you love frosting, then cake it on. I am not too big for frosting, so I chose not to do a lot. After your frosting is on put it in the fridge for about 20 minutes. This will make sure the brownies are really cooled down and also will thicken your frosting a tid bit. While you’re at the fridge get the ice cream from the freezer and to let it soften up and make it super easy to put on top of your brownies. During that 20 minute time lapse, make your Oreo crunchy stuff! Grab your bag of oreo’s and some Magic Shell. Blend 2 rows of Oreo’s in the blender, or food processor if you’re lucky enough to own one! If you have one, don’t tell me, I’ll be jealous. 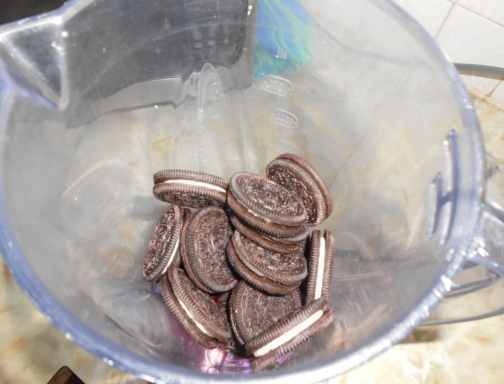 Transfer your Oreo’s to a bowl and pour a little more than half of the Magic Shell into the Oreo’s. 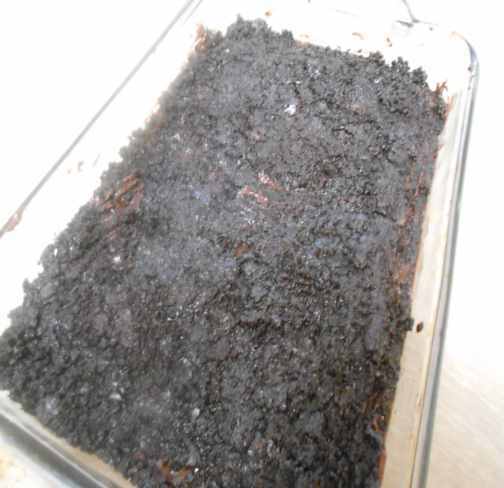 Take your brownies out of the fridge, and put all of the Oreo crunchy stuff on top of the brownies. 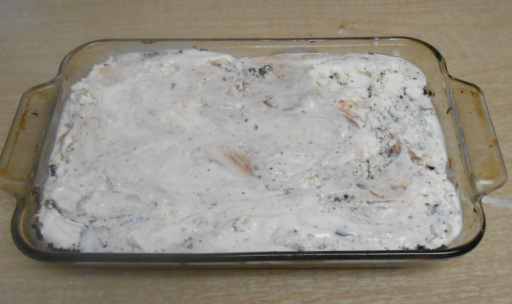 Take your thawed ice cream and glob it on top of the crunchy Oreo layer. I used Peanut butter ice cream. We are huge peanut butter lovers at my house, and chocolate and peanut butter is even better! You can use whatever ice cream your like best. I think any kind would be good with this. I almost choose Moose Tracks, but opted for the more peanut buttery taste. You’re almost done!! It really doesn’t take very long, I promise! Now the next part I made my own whip cream. If you want to do that you can, or you can buy some. I just bought whipping cream and then I added a tablespoon of sugar and about 3-4 tablespoons of chocolate frosting to make it more sweet and chocolaty. It was so good! Spoon your whip cream on the ice cream layer carefully…. You’re done! Cover with foil and put it in the freezer for at least 1 hour, but 2 hours would be best. I let mine set over night. I hope you enjoy this as much as we did! It’s a new favorite. I think every time I make it I will try a new ice cream flavor. 1. Spray your pan. 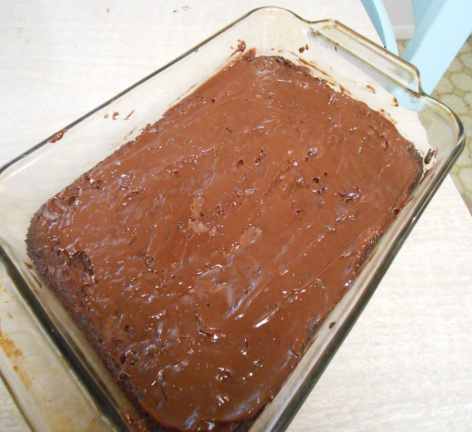 Bake your brownies according to box directions in a 9×11 thick/tall baking dish. 2. Let it cool completely about 20-30 minutes. 3. 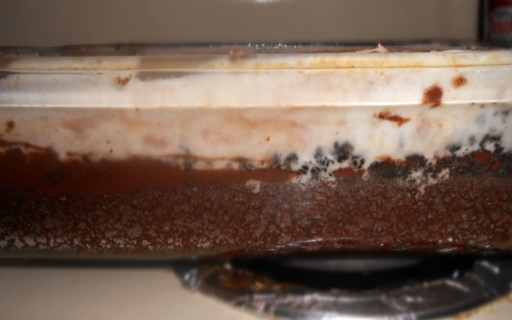 Add frosting onto the cooled brownies, put in the fridge for 20 minutes. 4. Take ice cream from the freezer and let it sit out and thaw while your brownies are in the fridge. 5. 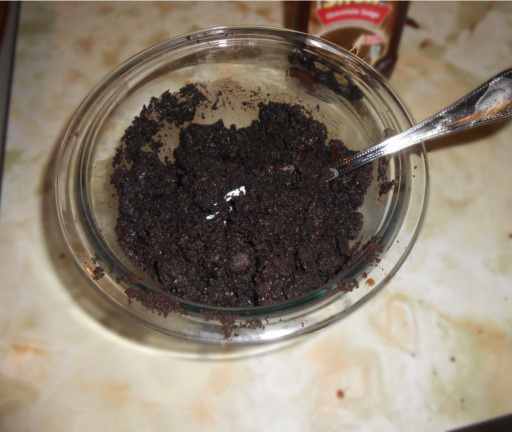 Make your Oreo Crunchies. 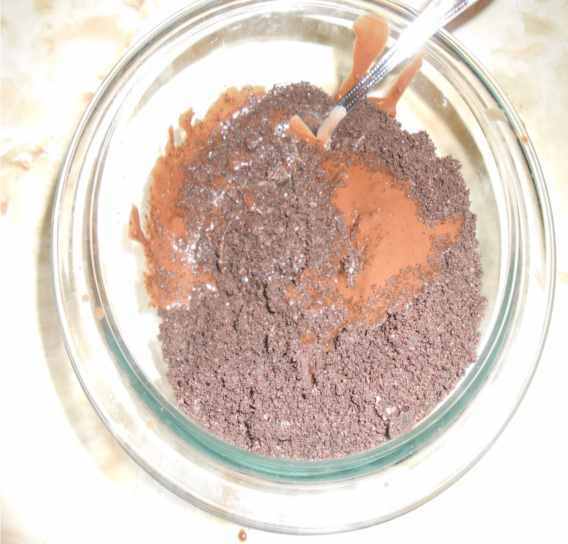 Start out by blending your Oreo’s in a blender or food processor. 6. Move Oreo’s to a bowl and pour Magic Shell over the Oreo’s. 7. Mix together until it is kind of Oreo clumpy. 8. Put on top of frosted cooled brownies. 9. Take your thawed ice cream on put that on top of the Oreo layer. 10. Make your whipped cream or use store bought. 11. Put that on top of the ice cream layer. 12. Cover with foil and put in in the freezer for at least 2 hours, if not more. Enjoy this tasty new ice cream treat!! If you try this out let me know, I’d love to see what you did to your ice cream cake! « New Tasty Veggie Potato Chips from Green Giant™! Oh my you just made my day. My husband will thank you for this. THANK YOU!And God Bless!Denise Reeves of Flint,Michigan! 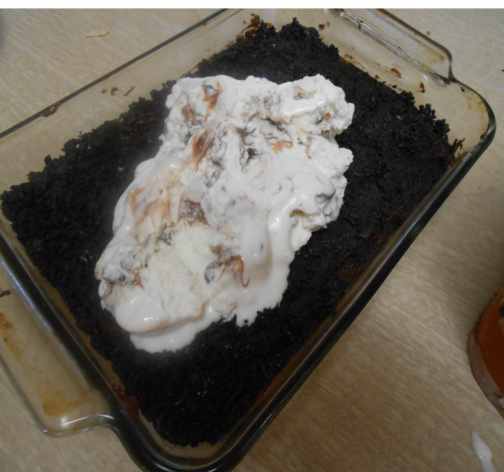 I made this for my family they LOVED it thank you so mych for posting this I have found our new favorite dessert. This looks and sounds divine! Thanks for the recipe! This looks so good I will have to try this! My aunto makes something similar and it is so delish! I have two grandsons and they are my life. We spend a lot of time together and I enjoy every minute. We go to movies, bowling, bingo, arcades, swimming (when the weather permits) and many other activities. Being a grandmother is the best. I really enjoy I love my kids. We are starting to plan creative activities and will forward these items that they come up with. It is great seeing and hearing them plan and come up with there own ideas. Please send me any activities that you may have come up with for your kids. Cooking is also a great activity. My kids would love this!! I would to if I wasn’t allergic to dairy. So hard to find yummy stuff now. that looks really good! thanks for the recipe!! Yummo. I get an ice cream cake every year for my birthday from Dairy Queen. They are the perfect cakes for non cake eaters! Loved the recipe!! You said you wished you used an 8×8, so that’s what I used, and the brownie was just a little too overwhelming. Next time I think I’ll go for the 9×11, cause the flavor was delicious!!! That’s great to know. Now I probably won’t use an 8×8 anymore! I will let my readers know. Thanks! this is an amazing recipe. These cakes are so expensive to buy I will definatly be trying this at home! Wow, this looks soooooo good! This would make my husband and daughter go gaga! I am sitting her imagining the different ice cream flavors we could mix and match. This will be great for an end of summer get together as well. Thank you for sharing! This cake looks great, love ingredients, who hates chocolate?, not me. 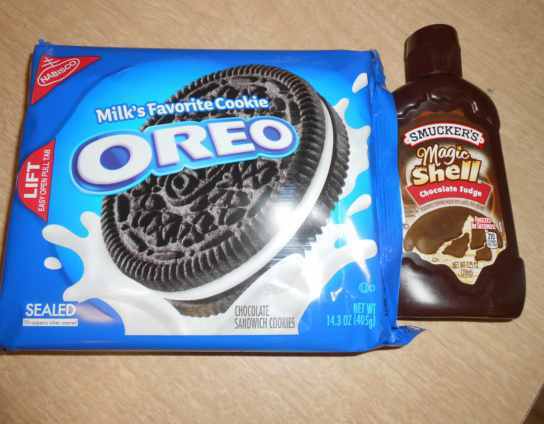 I like the idea of mixing magic shell in with the crushed oreos. I will have to try it. Wow, this looks delicious. I love Oreos! This would be a great Friday night beginning of the weekend desert! My kids will LOVE you for it. I want to try it tomorrow. Thank you. Yum. It looks like just the recipe to curb my sweet tooth but will be a messss…Will be very fun to do with the boys and pretend its mud pies. Looks like a great birthday treat for the kids. I am going to have to make this for my grandchildren really soon. I will be their favorite person in the world for at least a day or two! I would let them help me make it but I don’t think they have the patience to wait the two hours it takes in the freezer! I think I could use this as my little boy’s birthday cake & he’d be ecstatic. Oh my, I think I gained weight just looking at this tasty treat! I think I will make it but use vanilla ice cream instead. It seems like too many flavors going on for me. Thanks for the recipe! OMG…I think I just died and went to heaven!!! I will definitely be giving this recipe a try!!! Thank you! This is awesome! My sister made it a few years ago and it was great!!! 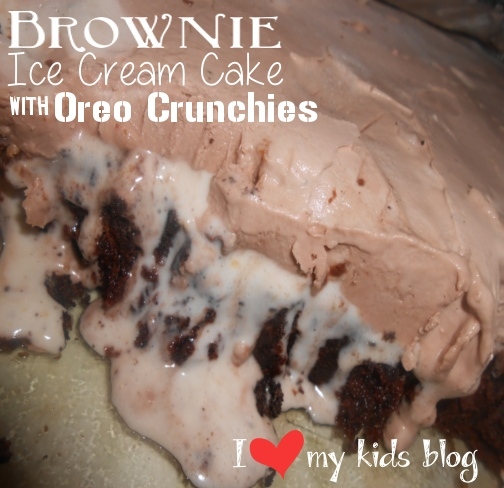 This recipe has to be great tasting!It has everything I love in it.I love brownies,and I love ice cream.I am going to try this soon.Thanks for sharing! This looks super yummy. My daughters love Oreos and I will have to try this for them. Thanks for sharing! That ice cream cake looks goood! YUMMY!! !I will have to try this recipe out :).My family loves everything in it .Should be a fun evening when I do it.Thanks for sharing! 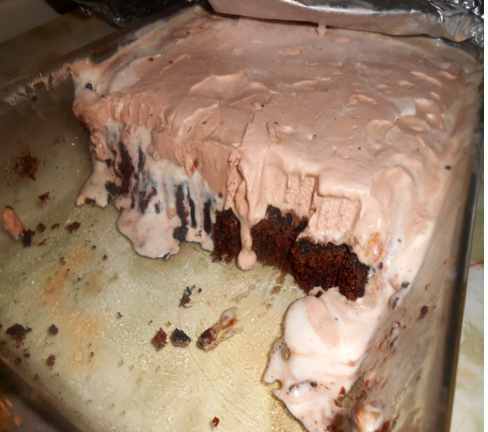 My grandson will want some gummy worms with this delicious Brownie Ice Cream Cake with Oreo Crunchies and thank you for the contest!! WOW anything chocolate is a girls best friend. Love ice cream cakes and brownies this would be awesome! i think i’ll be making this…this weekend!!! My mouth is watering!!! I am making this today!!! Looks awesome but I would use mint chocolate chip ice cream! This is looks so easy and delicious. My family will really enjoy this one! This definitely looks like something my son would like. I think I could actually make this. It certainly looks yummy every step of the way! My family would LOVE that!! Yummy! Wow this looks yummy will be making for the kids. That looks so good! I am so gonna make this, thank you for sharing this awesome recipe. I love oreos and brownies!! This is the kind of deliciousness that makes me sad that my son will never be able to have dairy. IT looks delicious. I will definitely have to try this! I have a boy that loves to make brownies and adores oreos. He’s going to love this recipe! Thanks for sharing. Oh, this looks delicious and decadent! I would put peanut butter ice cream on it too, like a Reese’s. my daughter has made something like this before, and it was so good. my kids would love this. looks yummy. Oh my – yummy and full of sugary goodness! I Thank You for the chance to enter ur sweeps and think it is great that there is people like u that are out there to help people who might be going through hard times and this might be the only way there child or children will have what they need. I know it means the world to me!!!! THANKS SO MUCH!!! That looks so good! My daughter has Type 1 Diabetes so I will have to use a few sugar free substitutes but am going to try to mimic yours! Wow ! I am so glad I found this my kids will love this for parties !! Plus so many flavors to try !! Looks delicious and super easy to make, thank you for sharing! This is my kind of dessert, I love chocolate anything. Will have to make this one sometime. Looks soooo very delicious, very tempting, and I’m trying to lose it all at the gym mind you but I have such a soft spot for sweets, esp chocolate!!! Wow! That looks fantastic. The family is gonna love this one! Looks amazing and I will definitely have to try it. That looks incredible! I will definitely be trying this one! Thank you for the recipe!! Holy calories Batman! I am so goiing to try that! I bet it would go good with chocolate wine….. This Looks so delicious. Gonna have to try this. I sort of wish I could have Oreos and sweets. This looks amazing. Wow that looks soooo yummy! Can’t wait to try it! OMG! I am going to fix this tomorrow!!!!! Im so hungry now! OMG that looks good! I will have to try this! I think I could get a toothache looking at this- one of those desserts, though, that a bite or two really would satisfy you so you wouldn’t consume a gazillion calories. I’m a chocoholic; so, this looks yummy delicious and I would love to eat some of it! Unfortunately, I can no longer enjoy treats like this due to having to watch my sugar and carbohydrates for health reasons. I would love to see a healthier version of this so that I and others like me, who should not eat a lot of sugar and carbohydrates, may enjoy such a great dessert. This looks AWESOME! I know my whole family would love it. Thanks! Mmmm, I LOVE Oreos, there a staple in our house. We’re definitely going to have to try this…… Now I’m hungry, lol. Although I can’t eat this because of health reasons, I would love to make this for my family. They love Oreo cookies and ice cream so this would be the perfect treat for them. Thank you so much for the recipe! I have been looking for a recipe like this.My son’s birthday is next month so I am thinking this will be his cake.I am pinning it for later use. I don’t know where to begin. How does one pass this recipe up? It looks so easy and delicious. I will for sure be bookmarking this one!!! Thank you for sharing! It’s a cookies’n’cream and brownie ice cream cake! Oh my goodness soo good! OMG! Everything we love in one dish. You teach us how to prepare it very simply and the pics make it mouth watering. Oh My I showed this to my hubby. We are going to make some after the kiddos go to bed so we can have some for our selves before the kids eat it all. This would make a great birthday cake. This looks amazing! I love DQ’s ice cream cakes but we don’t have any near me anymore! This would fix that and be a heck of a lot less expensive!! That looks so good. I can’t wait to make it for my family. Thanks for sharing this recipe. My hubby and little one would really love this! Can’t wait to try it;) Thanks! This looks like something you’d get at Dairy Queen & since our local DQ closes in September (& I’d have to drive a 1/2 hour to the only one in our area that DOES sell them) thanks for sharing this so I can make it at home! I am pretty sure my husband would love me forever if I made this dessert. He is a huge fan of Oreos and ice cream! omg this looks so yummy.. I have got to make this for the kids… grand kids…. and me smiles looks really good. I really am going to try it… love chocolate! This looks good, but since I took everyone to the Dentist this summer. Dentist no more sugar for a while. I don’t know what to do for Amia’s birthday on Sunday. Oh man! That looks so yummy!! And it’s something different from the usual cakes and pies! My five year old is a chocolate monster, so he would LOVE this! Oh my this looks easy and delish! I will have to try this recipe soon. A girl can never have too much ice cream and brownies. Looks easy enough! Thanks! Oh my that looks so delicious. I may have to try that very soon. It’s so off my diet, but looks worth it! OMG ….I am so totally trying this …I think I will make it with my two oldest grandbabies …Thank you for the recipe!! This sounds very good. I love ice cream. yum! My daughter would love this! Great recipe. That looks yummy! Do you have any recipes with lots of caramel and peanut butter that are just as yummy? That looks so good. Thank you so much for posting this recipe…what could be better than chocolate and ice cream. Rich and sinful, but it looks scrumptious! I especially like the step-by-step photos.